the output voltage or current of the unit to obtain full output power with lower noise and higher precision. 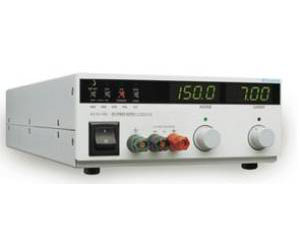 This 6210 series of constant-voltage, constant-current power supplies is available in power ranges 1000W (in 3 1/2 inches of vertical rack space, half-rack cases). All models have 10-turn voltage and current controls that vary the voltage (7.5V~600V) and current (1.6A~130A) outputs from zero to the maximum rated values. Crossover from constant voltage to constant current operation occurs automatically when the load current exceeds the control settings, another provides an adjustable current limit, allowing user to the current limit without your having to short the output. used for R&D design characterization, production testing, and QA verification of commercial, industrial, and aerospace electronic products.